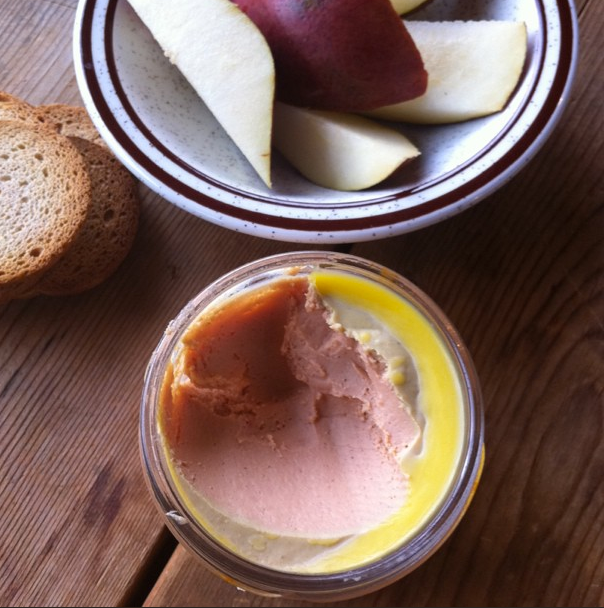 If you ever want to elevate your picnic try try bringing some foie gras mousse. This also applies events like bad movie night, a root canal or 3am at Sick Kids with your wheezing child. I would add doing your taxes to the list, but if you’ve had the discipline to start your taxes you are certainly not going to continue knowing there’s foie gras mousse around. This particular jar came from La Ferme Basque is Baie-St-Paul where we stopped during our Charlevoix vacation (read about it in the Globe) in August. The woman who runs the operation is from the Basque region of France and makes the foie gras in a traditional way. Even her lilting and soothing french accent could not make “force feeding” sound completely benign…. but it helped. I suppose had I had serious moral dilemma with the whole thing I wouldn’t be showing you a half-eaten jar. But, at least on a smaller scale using more traditional methods the whole thing sounded more humane. And tasted so good on a baguette. Near the end of their lives, for four weeks the geese are force-fed corn to fatten their livers (the traditional process is known as gavage). 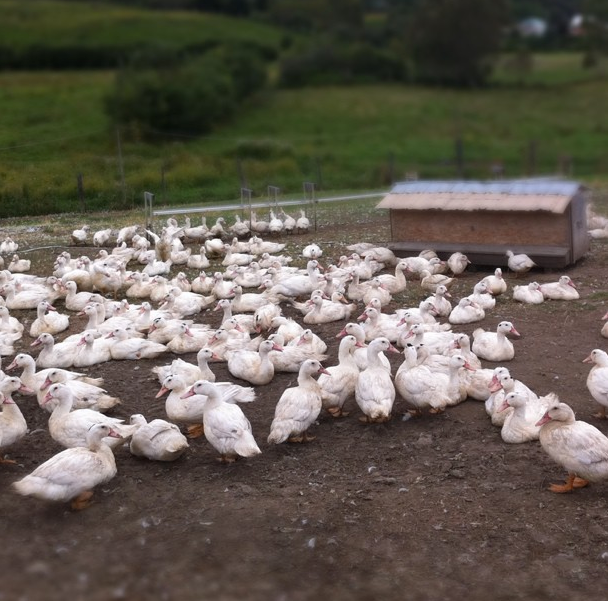 Apparently geese are very social and like to be together (…birds of a feather is so true…) so unlike large industrial producers La Ferme Basque keeps the geese in groups, not seperate cages, so they are less stressed. Goose 1: Hey, did you just have a tube filled with liquid corn and corn syrup shoved down your throat? Good 2: Yes. Can I sleep beside you? Goose 1: Hey, did you just have a tube filled with corn kernels shoved down your throat? Goose 2: Yes. Can I sleep beside you? Goose 3: Get in line. Apparently the main reason some geese die because they are overfed. Errrr…OVER over-fed. On this smaller scale there are two or three people who do the feeding twice a day. In traditional “gavage” the same feeders always work with the same geese and they keep a hand at the base of the neck and can tell when it is dangerous to give more food. It varies from goose to goose (I know my limit with gummi bears is 3/4 of a lbs). In industrial production each goose gets the same amount of corn-liquid no matter what their size. I also did not know that there were specific breeds of geese which were naturally better at digesting. So obviously better for forced gluttony. All in all, the geese are treated humanely (aside from the tube in the throat) and then shipped off to be slaughtered and turned into luxury food. See–it’s hard to be totally on board when everything you write has to be followed with “aside from the tube in the throat”. The goose had a great day at the CNE followed by some light tapas and Salsa dancing (aside from the tube in the throat). The goose loved going on joyrides in the tractor and dancing under the light of a silvery moon (aside from the tube in the throat). Decide for yourself— read this excellent posting about the controversy and the guilt of loving foie from the Guardian UK. Sue Riedl, you funny, funny person, you! Next time you swing through Montréal, check out either “Kitchen Gallery” restaurants (one in Old Montréal, another near Jean-Talon Market) do yourself a favour and treat yourself to their ‘Foie gras au torchon’. *Or* you could hit “Au pied de cochon” and order a ‘Poutine au foie gras’. It’s just a crying shame neither of them deliver. I readily confess that I adore foie gras- game over. I feel a little guilt about how geese and ducks are handled in the ‘making’ of this fine fine spread, but I hardly think that animal discomfort/abuse is limited to our feathered friends. It’s unfortunate that many meat eaters fail to connect with the very real horrors of many farmed animals while foie gras’ infamy seems rather well-known and taken to heart by the urban carnivore. About 10 years ago I lived in Périgueux, France, for more than three months and my absolute favourite eats were the farmer’s market foie gras wrapped in magret de canard jerky- sublime. I would bring it back to my hotel room and slice these wheels of delirium. My daily dinner was from a bistro/café in the town square where I would order the appetizer cognac-infused foie gras served with crostini. It was a ridiculously French-small portion and I never felt like I had eaten enough, let alone a meal size, but the price tag was all I could afford and there was no way I could be tempted into ordering anything but foie gras. When in the Périgord-! I love your reply–I love that you ate foie everyday. And I do think that you are right, if you’re going to be upset about foie gras maybe we should think about the chicken we eat on a more regular basis and how it is raised and killed for mass market. Just makes one want to be a vegetarian…who eats foir gras.